The Blademedic™ Knife Sharpener is the first responder for field repairs on all types of knife blades. It’s able to tackle regular or serrated blades, gut hooks, hunting knives, or fishing knives. Just about any knife using one or all of the following elements: Tungsten Carbide, Ceramic Sharpening Rods, Serrated Knife Sharpener, and Diamond Tapered Rod. In just three or four strokes you can restore your blade and polish it to a finished edge. 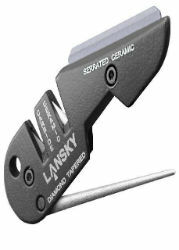 This sharpener is designed to get inside even the smallest serrations. It can be used for fast reconditioning and maintenance.